A reflection on patterns, pleats and repetitive cycles, the concertina functions as a poetic memory trigger, a step back to another time period. One may expect to pick it up and produce the squeaky sounds of an old squeeze box, but this concertina contracts on its own as it sing its songs of breath, the very basis of our existence. We reference family history through the tartan cloth, evoking memories of old-time music played at family gatherings, of player pianos. We ponder the repetitive patterns that happen throughout history, reflected in the sound of breath: cycles that reoccur over and over again and mistakes we may or may not learn from. 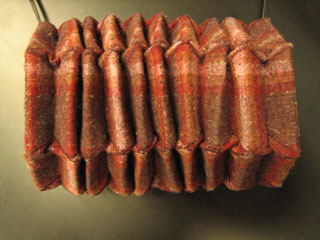 Constructed using traditional pleating techniques in a wool plaid fabric, the pleats are crisp and hold the form of the concertina. There are strands of Nitinol sewn to the inside structure. Nitinol is a shape memory alloy made of nickel and titanium that can return to a preset shape when heated. 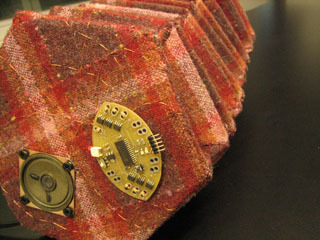 Using our custom electronics and programming, the concertina can contract autonomously. The weight and structural construction of the piece brings it back to its original form. There are mini speakers imbedded in each side that play the breathing sound track. Marguerite Bromley is a textile artist based in Montreal, working on large scale sculptural fibre art, often with a hint of interactive electronics. She is researcher and creator at XS Labs as well as an art educator. Marguerite holds a BFA in Art Education from Concordia University and has taught workshop in Montreal, Toronto, SIGGRAPH in Boston and the National Institute of Design in Ahmedabad, India. She has exhibited throughout Canada and cast a bit of textiles art into everyday life. Wool process, sheep, shear, clean, dye, cart, spin, weave. Memory is triggered by the tartan in the wool, the whimsicalness of a concertina, similar feeling to a player piano.